Regarding the possibility of holding another round of reunions of families separated by the 1950-53 Korean War in October, South Korea’s Ministry of Unification said it would have to observe negotiations between the two Koreas. “(We) will have to further watch the circumstances surrounding (the arrangement of) the reunion event, such as inter-Korean negotiations. We have continued to raise the urgency and the need to resolve the issue of separated families on various occasions,” Baik Tae-hyun, ministry spokesman, said in a regular press briefing Monday. Baik added that the government would make efforts to “fundamentally resolve” humanitarian issues that stem from the division of the Korean Peninsula 65 years ago. The ministry’s announcement came after a weeklong family reunion event held in North Korea last week. The two-part event allowed about 600 South Koreans to meet their long-lost North Korean relatives at the scenic Kumgangsan Resort on the North’s east coast. Park Kyung-seo, the head of the South Korean Red Cross, said Saturday that he had reached a “consensus” with his North Korean counterpart to hold another round of family reunions “in a similar manner to that” of last week’s event, as early as October, on the sidelines of last week’s reunion event. He said that details such as the specific dates would be discussed at working-level talks. While Seoul’s plan to open the liaison office in Kaesong by the end of August may have hit a snag with last week’s cancellation of US Secretary of State Mike Pompeo’s visit to the North, experts see the reunions as a separate matter. “North Korea has been calling for the repatriation of the 12 female restaurant workers as a precondition for the reunions, but they followed through with the Panmunjom Agreement and cooperated in preparing for last week’s reunion event,” Cho Han-bum, a senior researcher at the Korean Institute for National Unification, said. 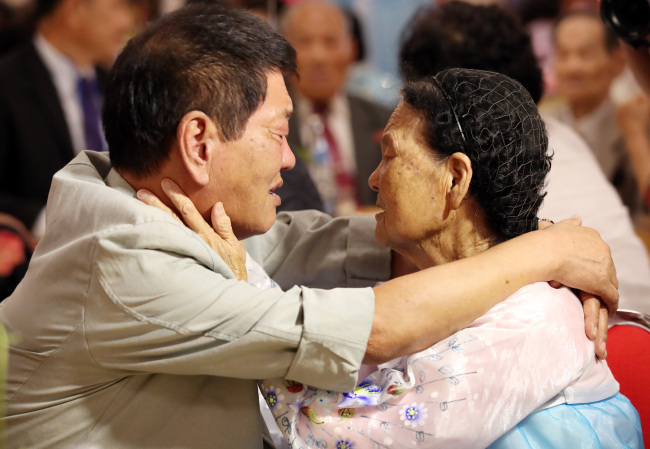 South Korea has been seeking to hold the family reunions regularly as soon as possible due to the advanced age of the members of the separated families. Plans involving cross-border letter exchanges and hometown visits are also being considered. While there were initially 132,124 South Korean members registered in a government database, only 56,990 remained alive as of August. Among them, nearly 86 percent of the group are 70 or older. The family reunions were part of the agreement reached between Moon and North Korean leader Kim Jong-un during their summit in April.